When Farah got in touch to plan her photoshoot I was so excited. People usually do this shoot around 32 weeks but Mom wanted to tell her family that they were having a baby girl in photo form! 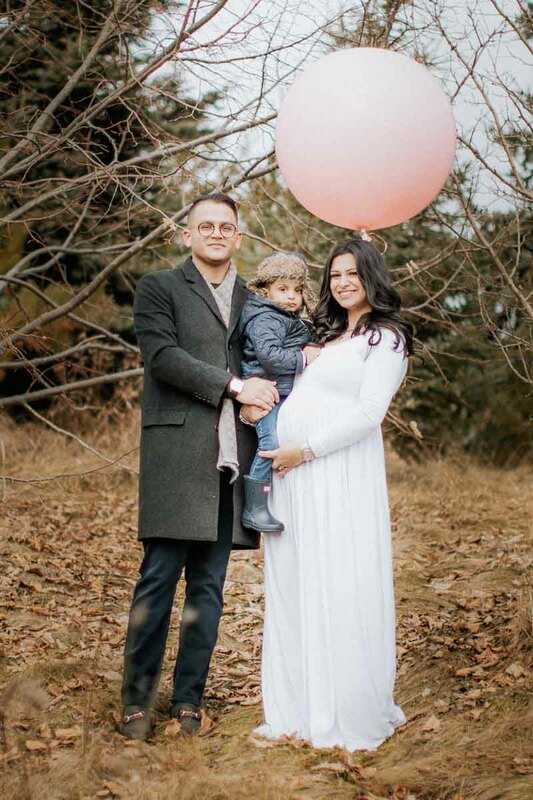 Her beautiful idea was to have big-brother-to-be Issa holding a pink or blue balloon sitting in a sled on a snowy hill. 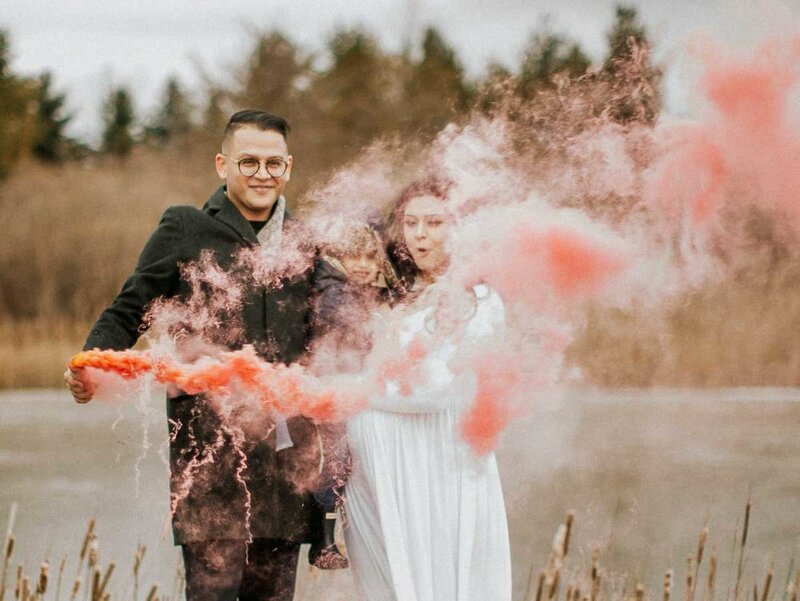 We planned to shoot in early December after the ultrasound, hopeful there’d at least be a dusting of snow, but as you know it’s been a weirdly mild winter. And then baby was playing shy at her first anatomy scan, so Mom had to reschedule after her 3D ultrasound so we could get the right ballooon. By the time we could finally shoot there still was no snow but it was -1,000,000 with crazy cold winds. Not perfect for photographing a toddler outside but it didn’t matter. These guys were so gorgeous and lovely with each other that it was keeper after keeper. 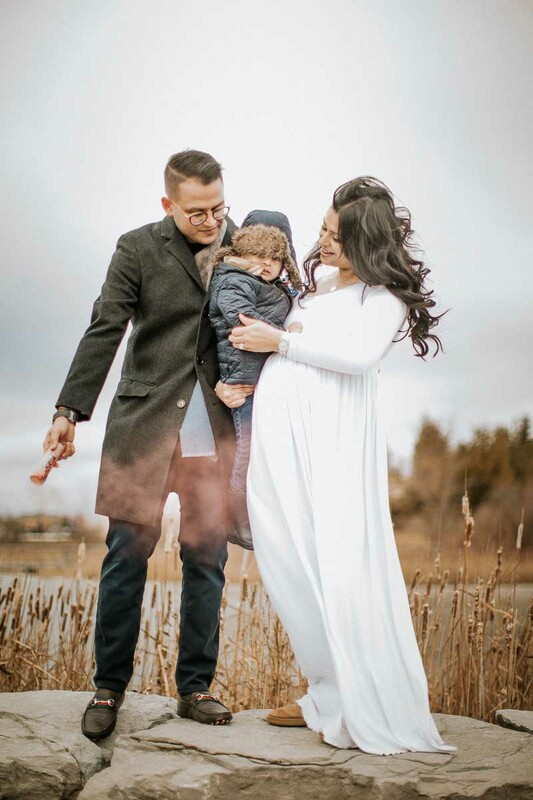 Mom wore a stunning dress with a faux fur wrap, and Dad and Issaa were in equally perfect outfits. I was excited when I saw the balloon but even more excited about the SMOKE BOMB! 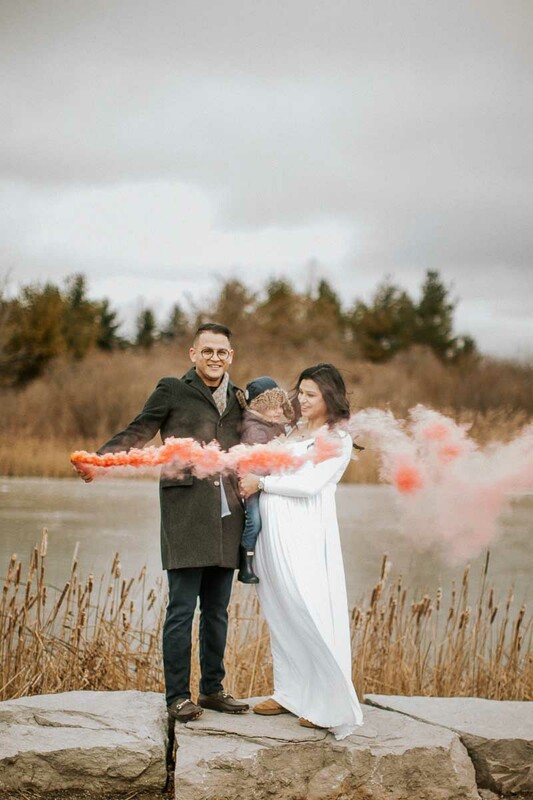 After some family photos in a protected corner we headed out in to the weather to get our balloon and smoke bomb photos! 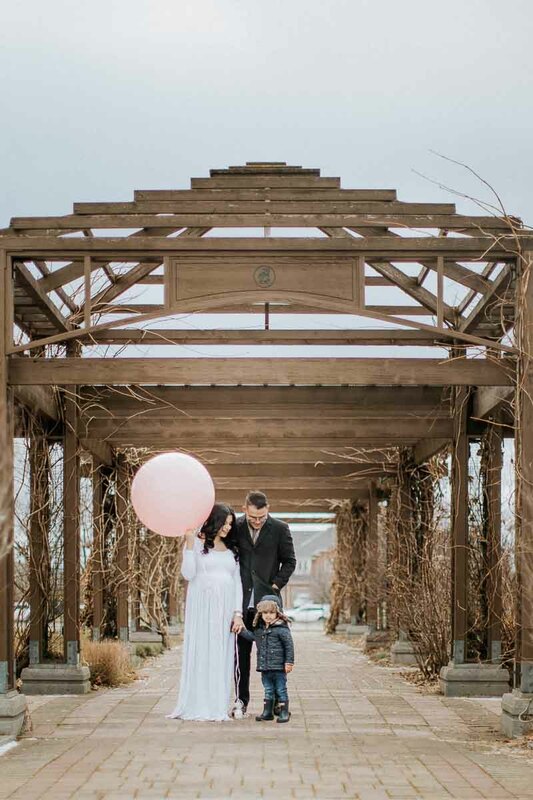 I love symmetry and when I saw the gazebo we had to do the balloon photos there. Then we headed over to the beautiful man made pond at Richmond Green to let off the smoke bomb. It was so exciting and way more smoke than I expected. I love the effect and can’t wait to shoot with more of these things! We had frozen our tushes off pond side we went and warmed up in our cars for a minute before heading over to some tall grasses for probably my favourite part of the session. 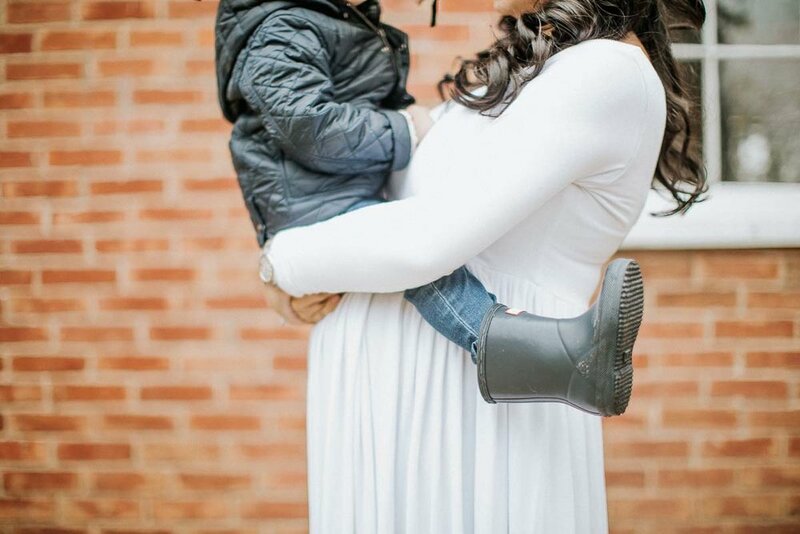 I’m so excited to share these with you, scroll through to take a look!